This sounds like an intriguing obscurity. Another one from Code Red I see. Thanks to you Brian I have an ever increasing shopping list of DVD's...you're going to cost me a fortune! 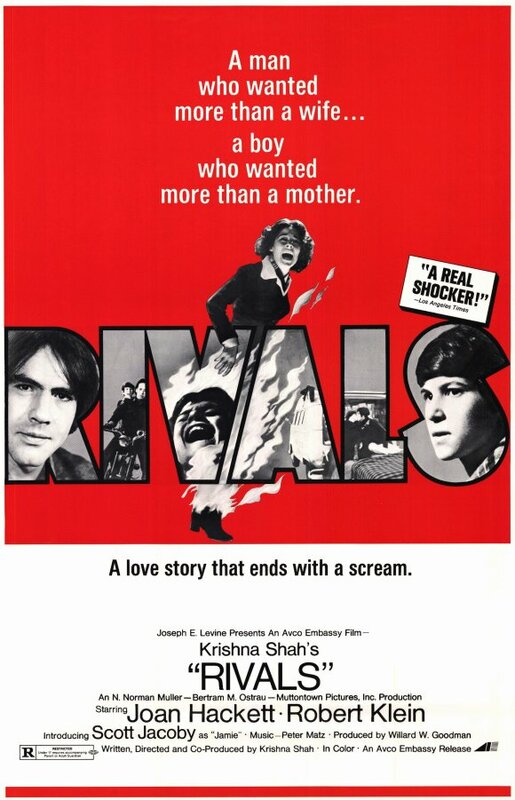 I've added RIVALS to it...a great review! Thanks, Shaun. 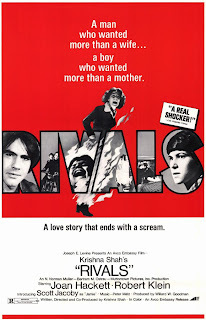 RIVALS is a thoroughly irritating movie in terms of figuring out what it's supposed to be or what Shah's intentions were here. It played much better on the second viewing, but my opinion didn't change at all. It's worth seeing for its balls out weirdness. A shame CR didn't have enough faith in it to do any extras, much less a menu for this one. The trailer for FAMILY HONOR, a movie they've been teasing for a few years now, starts automatically, then the RIVALS film. When it ends, the RIVALS trailer plays and then a few additional trailers. I'm honestly surprised CR is still in business considering the obscure nature of so many of their movies and according to them, their discs move relatively few units. Which is a shame, because they do have some genuinely fun movies in their catalog. I should have reviews for WORKING GIRLS (See Elvira naked!) and NIGHTMARE coming up this week. Hadn't heard of this one. Seems like a lot of filmmakers liked to include street theater in films from this time to give them a semblance of authenticity and relevance -- Billy Jack comes to mind. You make Code Red sound like an admirable venture; I suspect they ought to be grateful to you. Yes I've heard mixed notices about Code Red. The problem for me is that I'd have to import the discs, which means I'd probably end up spending twice what you do for them in the US. On the Amazon Marketplace here in the UK, they tend to sell for around £9-12 including P+P. This is a lot I think for unproven obscurities I haven't heard of. However I do look forward to your review of NIGHTMARE. It's a film with few redeeming qualities, but I'm sure you'll find some. @ Sam: I enjoy purchasing many of their discs whether I've seen them or not as they are really taking a chance by releasing some truly obscure movies. I also like how they utilize original poster artwork for their discs. They are a strange company at the same time, though. They've gotten a lot of flack for things of minor importance as well as obvious things. Some they've brought on themselves, but it's no doubt difficult to satisfy any fan of rare or niche movies especially if they are uninvolved in securing said films for release and all the process entailed in releasing them. @ Shaun: I've seen NIGHTMARE a few times on videotape. The first time was from Continental in one of those glossy big boxes and again under a fake title called BLOOD SPLASH which had this big sticker on the back hyping Tom Savini's involvement in the picture. The new DVD is supposed to put to rest what he really did on this movie.